Alex Mayer is the Member of the European Parliament for the East of England. She sits on the European Parliament’s Committee on Foreign Affairs, Subcommittee on Human Rights and Committee on Employment and Social Affairs. 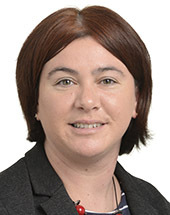 Before becoming an MEP she worked across the East of England for the British Heart Foundation, the environmental campaigning organisation SERA, and managed the Cambridge MP’s office. She is a member of the GMB trade union and a life member of English Heritage and the National Trust.